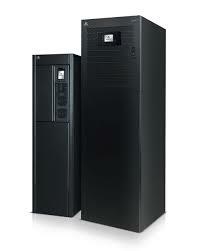 The Liebert EXS is an on-line, three-phase, 208/220V integrated UPS, with a compact footprint. Standard configurations offer a reliable and economical power solution in 10, 15 and 20kVA capacities. A proven on-line, double conversion, transformer-free design offers reliable performance and high availability. The integrated maintenance bypass ensures critical loads operate, even during service. The Liebert EXS utilizes an optimized tower design to deliver reliable power in an efficient, flexible and integrated platform. The EXS is ideal for small data rooms, IT closets, servers and storage, branch, small-midsize IT systems, medical/lab testing equipment, VoIP, ISDN & frame relay applications, storage systems, and security systems. For more in-depth information, see the Liebert Data Sheet.